Celebrate a season of friendship with the 38th Christmas ornament in the Frosty Friends series. Frosty pulls his brown husky dog pal for a ride through the glittery snow on a red sled dated " 2017." When you see it hanging on your tree, you'll want to yell "Mush!" Festive and collectible, Hallmark Keepsake Ornaments come ready to give in a seasonal holiday gift box. The box can also be used for ornament storage. This Hallmark Keepsake Ornament measures 3.5 x 2.1 x 1.7 inches and comes in a 2.9 x 5 x 2.5 gift box. Ornament is made of plastic. Designed by Tom Best. Coordinates with the 2017 Frosty Friends Book from the Hallmark Keepsakes Holiday Series (sold separately). Each piece includes one 2017 Frosty Friends Dog Sled Christmas Ornament in a gift-ready box. From preserving precious memories to commemorating special milestones, there's a Keepsake Ornament for everyone on your list. Hallmark has been your family-owned creator of greeting cards, gifts, gift wrap and more for over 100 years. We take deep pride in helping individuals connect in just the right way. This Hallmark original Keepsake Ornament features unparalleled artistry and exceptional detail. The ornament is lead-free and made for years of celebrations. Frosty Friends Series #38. 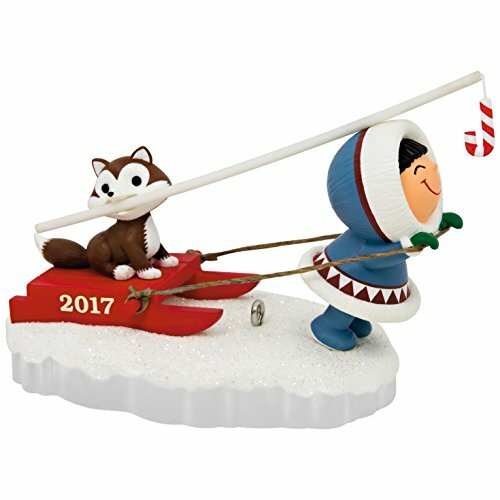 38th in the Frosty Friends series, this Christmas tree ornament features cute little Frosty taking his brown husky dog friend for a ride on a red sled in the snow. This Hallmark Keepsake Ornament measures 3.5 x 2.1 x 1.7 inches and comes in a 2.9 x 5 x 2.5 gift box. Ornament is made of plastic. Designed by Tom Best. Coordinates with the 2017 Frosty Friends Book from the Hallmark Keepsakes Holiday Series (sold separately). Each piece includes one 2017 Frosty Friends Dog Sled Christmas Ornament in a gift-ready box. Allstate Diva Safari Glittered Zebra Animal Print Diamond Prism Christmas Ornament, 5.5"